The Stormbringer multi-tracks were located in 2001. The tapes are in excellent condition and contain amongst other things three different vocals for 'Soldier Of Fortune', a powerful instrumental version of 'Highball Shooter' and Coverdale's original backwards bit for the start of the title track. 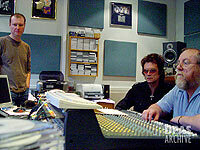 Glenn Hughes was asked and agreed to be involved in the remastered Stormbringer. A productive day at Abbey Road on October 30th saw Glenn Hughes (in between the Dudley and Northampton shows) get stuck into the Stormbringer tapes as if he'd left the studio just the week before rather than thirty-plus years ago. The material sounded astonishing; the studio recording quality is a lot lot better than Burn, much more defined, and the one thing everyone who came into the studio said during the day is that it was hard to believe the material was from 1974 - it sounded so contemporary. 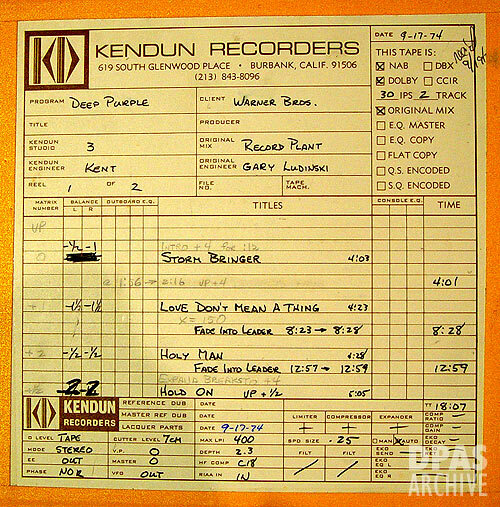 Glenn really wanted to do Holy Man and started out on that, but he soon got into the vibe and in all five songs were done during a long session. The results sound really excellent and there will be a few surprises for fans of this particular album to pick up on, as Glenn brought up some new vocal lines and other unheard bits and bobs, as well as emphasising different aspects of the material. I left the engineer finishing the remaster of the original album, before copying the quad masters. We'll then have a look at timings and work out a final track list for the new edition. 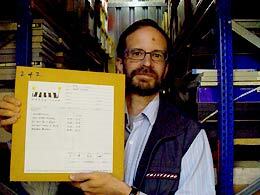 The photograph here shows EMI's catalogue manager Nigel Reeve, Glenn, and Abbey Road's remastering engineer Peter Mew. 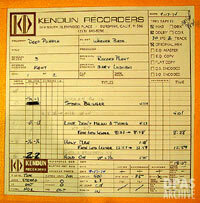 Also shown is the original tape box for the quarter inch album production master for the album. • "Is it yet known if the remastered Stormbringer will have a vinyl release?" Andy Butler. 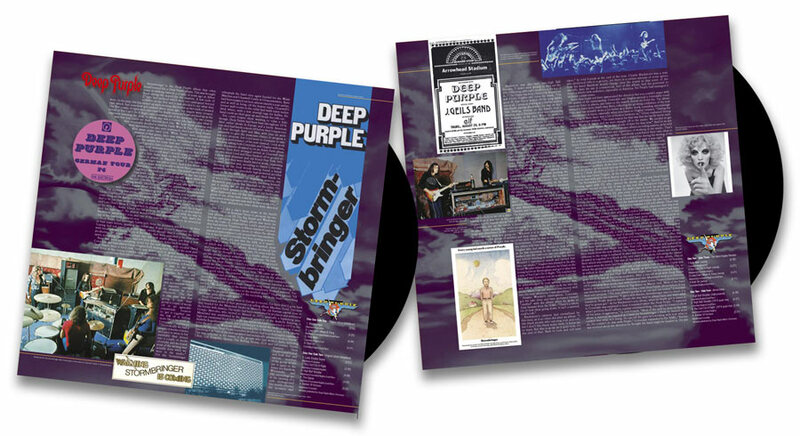 Here's a shot of the work in progress on the Stormbringer reissue sleeve. At first, with the actual artwork long gone (and we can't find where the painting is) the plan was to re-scan an original mint LP sleeve. To try and reduce the amount of retouching work, the original EMI poster was overlayed. Just as this work was about to begin, a contact at Warners in America discovered a large format transparency of the painting in their files. This will now be scanned in LA which should give a really high quality result. The reissue is going for the blue tint of the American sleeve, as this is how it was meant to look. 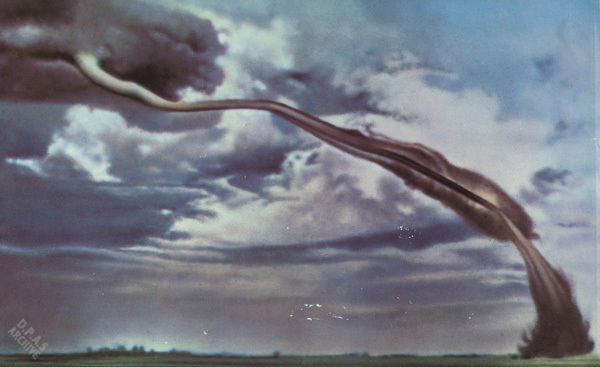 The second image shows what was clearly the inspiration for the illustration, a heavily hand tinted copy of the famous original photograph of a tornado, taken in July 1927. The slipcase design for the 2 disc edition is shown here, although this is subject to minor alterations. The CD booklet will carry the original album artwork, as will the double vinyl edition. Glenn Hughes has found time en-route between gigs to jot down his recollections from the sessions, which will be incorporated into the booklet. The special editions can now be pre-ordered from dpas mailorder. The wheels are turning on the Stormbringer remaster. There will be a 2 disc limited slipcase edition with original quad 4.1 mixes and other goodies, including Glenn's excellent remix work, video elements and more. There is a double gatefold vinyl edition planned, also limited. These are available to pre-order from dpas mailorder (anyone who ordered before this was posted will automatically be shipped the 2xCD edition). Once the two disc Ltd Edition has gone, the title will be issued as a lower priced 1xCD regular edition with the album, remixes and a few other items. It looks like the old CD version is being deleted so if you prefer the softer CD transfer, and haven't got this, best order sharpish. Glenn has contributed some text for the booklet, and a super big transparency of the original sleeve painting has been unearthed in America to use on the reworked sleeve. EMI say they have put Stormbringer back a couple of weeks to February 2009 due to scheduling pressure. 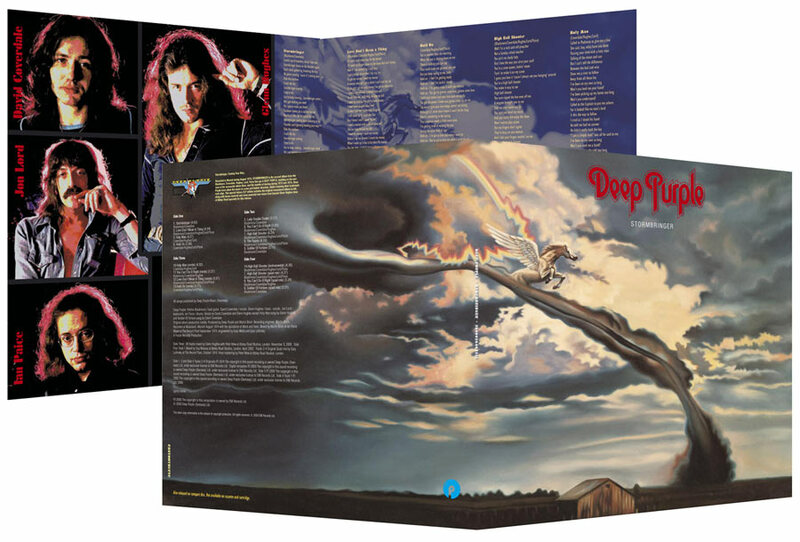 The first exclusive look at the remaster vinyl edition of Stormbringer. The photograph shows the outer and inner gatefolds, with another shot of the two inner bags. EMI have tried to make the sleeve look and feel as it would had they issued this album in a gatefold back in 1974. The lyrics have all been moved to the inside, with band images given a period look. The inner bags have all the material which appears in the CD booklet. There will also be colour labels (not shown). We do not yet have a pressing quantity for what will be a limited edition, but release is expected in February 2009 to tie in with the new date for the CD. You can pre-order this now at dpas mailorder.